Good Training is Fun. But not all fun training is good. Training should be fun. It should be fun because learning IS FUN. There is a certain thrill of excitement that you feel whenever you know you are learning useful, new stuff and making rapid progress. Making rapid progress feels like fun. So good training is fun. BUT that does NOT mean that "all fun training is good". They then concentrate their efforts on making the training day FUN. They introduce Fun games, and Fun activities, Fun ice breakers, and train by playing games. But it is important to note that having fun on a training course, does not mean that the training course was good. You have to ask yourself, "What benefit, other than having a few minutes of fun, did that game leave in the mind of the delegates who played it?" Did the learners manage to extract any definite principle; or behavioural laws; or practical tips; or rules of thumb; that they could take back to the workplace, and use immediately, to improve the performance of the team? Because ultimately, the net result of any training should be the application of proper principles that will improve the performance of the team. But pure fun, in and of itself, is NOT the purpose of a training course. So, when on a training day, tell the trainer to put away the Lego and the Plasticine. And let's learn exactly what we should say and exactly what we should do, to get the best performance from yourself and the rest of the team. And that would be a FUN thing to do. 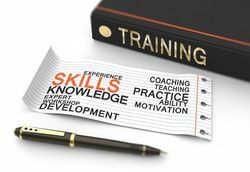 We can provide you with excellent, FUN training courses. Which topic are you most interested in? Our free Training Needs Analysis questionnaire will show you your relative strengths and weaknesses, together with how you might improve them.